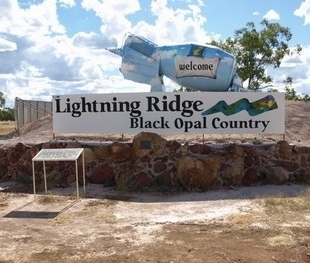 Lightning Ridge is definitely a unique place to visit, and although things may seem to run a little differently out in The Ridge - as the locals call it - you will be welcomed with open arms upon your visit. There is plenty to do in Lightning Ridge, so don't think for a second that because it is in the outback of NSW that you will find yourself bored and wishing to get back to the city. You can enjoy the Australia Opal Centre where you will come face to face with a life-like dinosaur, examine opalised fossils and learn all about opal mining and life on the opal fields. Best yet, it is free entry. For a first hand look into a working opal mine, visit Big Opal - Underground Mine Tour, the first licenced opal mine open to the public in Lightning Ridge. See a demonstration of fossicking and opal cutting and learn about the history of opal mining. Self guided tour is $10, a full tour is $22. If you want to try fossicking for yourself - sifting through the sand to find opals - head on over to the Fossicking Heap and try it for free. While you're exploring the town, don't forget to enjoy a self drive tour with the Car Door Tours. Appropriately named as the signposts for the tour are written on car doors along the roads. A unique way to see a unique town. After a hard day of exploring visit the Artesian Baths for a free therapeutic soak in the naturally heated thermal baths. There is plenty of different types of accommodation for you to retire in for the night. Whether it's a motel, charming B&B, cosy family cottage or caravan park you're looking for, Lightning Ridge has it. There is so much more to be discovered in Lightning Ridge than just the above mentioned. The history, fun and adventure of this quirky little town has a lot to offer and you wouldn't want to miss it.